If artists like Abdullah Ibrahim, Horace Silver and Jan Johansons nordic “jazzpoetry” make your heart beat with a happy rhythmic groove, you shouldn’t miss Martin Lutz Group and their original afro nordic soul-jazz. With a charming and untraditional line up (3 saxes! and rhythmgroup) the band serves an exciting and swinging blend of warm, evocative world jazz with a hint of Nordic melody. 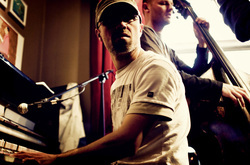 With four internationally acclaimed albums - one of which won a Danish Music Award (grammy) in the category crossover album of the year 2008 - Martin Lutz Group is one of the most exciting bands on the Danish jazzscene. Our 4th CD "In Denmark I Was Born", is available in stores and on iTunes etc. and has just been chosen as album of the week on Danish National Radio P8Jazz. Read everything you need to know - including a bunch of rave reviews, etc. on this page dedicated to the album.